Hungarian-American immigrant who made his fortune in America, and provided seed funding for the Open Society Institute and the Center for American Progress. 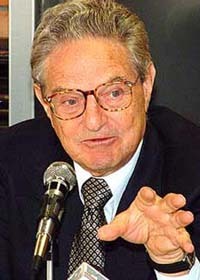 Gave $100M to Human Rights Watch, $1M to Media Matters for America in 2010, and $1M to a pro-Obama PAC in 2012. Widely but incorrectly credited by right-wing sources as having funded Air America Radio and virtually every other left-leaning or liberal cause.